Advaita Vedanta (IAST Advaita Vedānta; Sanskrit अद्वैत वेदान्त; IPA /əd̪vait̪ə veːd̪ɑːnt̪ə/) is the most influential sub-school of the Vedānta (Sanskrit for end or the goal of the Vedas) school of Hindu philosophy; the other two major sub-schools of Vedānta are Dvaita and Viśishṭādvaita. Advaita is often called a monistic system of thought. The word "Advaita" (“A,” “no;” “Dvaita,” “Two or three”) means “non-duality.” The followers of Advaita hold that its main tenets are fully expressed in the Upanishads and systematized by the Vedanta-sutras. Its historical origin was the Mandukya-karika, a commentary by the seventh-century Gaudapada. the first thinker, after the Upanishadic sages, to revive the monistic tendencies of the Upanishads in a clear and systematized form. The medieval Indian philosopher Adi Shankara, or Sankaracarya (Master Sankara, c. 700–750), a student of Gaudapada’s disciple Govinda Bhagavatpada, further developed Gaudapada's foundation and systematized Advaita Vedanta. Advaita’s philosophical conclusions proceed from psychological observation rather than from a scientific study of the material world. According to Adi Shankara, God, the Supreme Cosmic Spirit or Brahman is the One, the whole and the only reality, the divine ground of all Being. Human perception of the diversity of the material world comes about through incorrect knowledge of Brahman. Advaita rejuvenated much of Hindu thought and also spurred debate with the five theistic schools of Vedanta philosophy that were formalized later: Vishishtadvaita (qualified nondualism), Dvaita (dualism), Dvaitadvaita (dualism and nondualism), Shuddhadvaita (purified monism), and Achintya Bheda Abheda (inconceivable difference and nondifference). The Advaita literature is extremely extensive, and its influence is still felt in modern Hindu thought. The key source texts for all philosophical schools of Vedānta are the Prasthanatrayi – the canonical texts consisting of the Upanishads, the Bhagavad Gita and the Brahma Sutras. The followers of Advaita hold that its main tenets are fully expressed in the Upanishads and systematized by the Vedanta-sutras. Its historical origin was the Mandukya-karika, a commentary in verse form on the late Mandukya Upanishad, by the seventh-century thinker Gaudapada. Gaudapada was the first thinker, after the Upanishadic sages, to revive the monistic tendencies of the Upanishads in a clear and systematized form. In his own writings, he makes no reference to any earlier or contemporary non-dualist works. Adi Shankara's main works were commentaries on the Prasthanatrayi ([[Brahmasutra|Brahma Sūtras]], Bhagavad Gītā and the Upanişads) and the Gaudapadiya Karikas. A number of original treatises are said to be authored by him, but only one, Upadeśa Sāhasrī, can be securely attributed to Shri Shankara himself. Shankara was also the author of hymns and poems. Many followers continued and elaborated his work, especially the ninth-century philosopher Vacaspati Misra. Advaita rejuvenated much of Hindu thought and also spurred debate with the four theistic schools of Vedanta philosophy that were formalized later: Vishishtadvaita (qualified nondualism), Dvaita (dualism), Dvaitadvaita (dualism and nondualism), Shuddhadvaita (purified monism), and Achintya Bheda Abheda (inconceivable difference and nondifference). The Advaita literature is extremely extensive, and its influence is still felt in modern Hindu thought. Advaita’s philosophical conclusions proceed from psychological observation rather than from a scientific study of the material world. Our senses may deceive us, our memory may be an illusion, the forms of the world may be an imagination. The objects of knowledge may be open to doubt, but the self cannot be doubted. The self is undifferentiated consciousness, which exists even when the body has deteriorated and the mind perishes. The self is existence, knowledge and bliss, universal and infinite. Adi Shankara exposed the relative nature of the world by analyzing the three states of experience of the atman—waking (vaishvanara), dreaming (swapna), and deep sleep (sushupti). This idea of a fourth state of consciousness (turīya) apart from these three states is presented in the Mandukya Upanishad. According to Adi Shankara, God, the Supreme Cosmic Spirit or Brahman (pronounced as /brəh mən/; nominative singular Brahma, pronounced as /brəh mə/) is the One, the whole and the only reality. Brahman is at best described as that infinite, omnipresent, omnipotent, incorporeal, impersonal, transcendent reality that is the divine ground of all Being. Brahman is often described as neti neti meaning "not this, not this," because it cannot be correctly described as this or that. Brahman is actually indescribable. At best, Brahman can be described as "Sacchidananda" ("Sat," Infinite Truth; "Chit," Infinite Consciousness; "Ananda," Infinite Bliss). Brahman is the origin of this and that, the origin of forces, substances, all of existence, the undefined, the basis of all, unborn, the essential truth, unchanging, eternal, the absolute. It is the basis of reality, beyond perception of the senses. It (grammatically neutral, but exceptionally treated as masculine), though not a substance, is the basis of the material world, which is its illusionary transformation. Brahman is not the effect of the world. Brahman is said to be the purest knowledge itself, and is illuminant like a source of infinite light. Due to ignorance (avidyā), Brahman is visible to human beings as the material world and its objects. Ignorance is born of the confusion of the transcendental subject (atman) with empiricial existence (anatman). Ignorance is born of the confusion of the transcendental subject (atman) with empirical existence (anatman). To remove ignorance is to realize the truth, that the self is nothing but Brahman. Insight into this identity results in spiritual release. Mahavakya, or "the great sentences," state the unity of Brahman and Atman. They are four in number and their variations are found in other Upanishads. Īshvara (pronounced as /iːʃvərə/, literally, the Supreme Lord)—According to Advaita Vedanta, when man tries to know the attributeless Brahman with his mind, under the influence of Maya, Brahman becomes the Ishvara. Ishvara the manifested form of Brahman on the pragmatic level; his actual form in the transcendental level is the Cosmic Spirit. Ishvara is Saguna Brahman, or Brahman with innumerable auspicious qualities. He is all-perfect, omniscient, omnipresent, incorporeal, independent, Creator of the world, its ruler and also destroyer. He is causeless, eternal and unchangeable, and yet the material and the instrumental cause of the world. He is both immanent (like whiteness in milk) and transcendent (like a watch-maker independent of a watch). He may be even regarded to have a personality. He is the object of worship. He is the basis of morality and giver of the fruits of one's Karma. Ishvara himself is beyond sin and merit. He rules the world with his Maya, his divine power. This association with a "false" knowledge does not affect the perfection of Ishvara, in the same way as a magician is himself not tricked by his magic. While Ishvara is the Lord of Maya, and Maya is always under his control, the living beings (jīva) are the servants of Maya (in the form of ignorance). This ignorance is the cause of the unhappiness and sin in the mortal world. While Ishvara is Infinite Bliss, humans are miserable because of their ignorance. Ishvara can also be visualized and worshipped in anthropomorphic form as deities such as Vishnu, Krishna or Shiva. The world is a work, an effect, and so must have a real cause, which must be Ishvara. People do good and sinful work and receive its fruits, either in this life or after. People cannot be the givers of their own fruits, because no one would give himself the fruit of his sin. Also, this giver cannot be an unconscious object. So the giver of the fruits of Karma is Ishvara. The individual self, jiva, is a subject-object complex, with Pure Consciousness as its subject element, called the Sāksin. Its object element is the internal organ called the antahkarana, whose source is avidya. In perception, when a sense organ comes into contact with an object, the antahkarana assumes the form of that object, taking the form of empirical knowledge. Human suffering is due to Maya (incorrect knowledge), and only knowledge (called Jnana) of Brahman can destroy Maya. When Maya is removed, the Saksin is realized as the Brahman and there exists ultimately no difference between the Jiva-Atman (individual soul)and the Brahman. When it is achieved while livingan earthly life, such a state of bliss is called Jivan mukti. Adi Shankara himself was a proponent of devotional worship or Bhakti, teaching that the practice of ethical virtues and the pursuit of devotion and knowledge, resulted in the displacement of a false outlook (avidya) with a right outlook (vidya). But Adi Shankara believed that while Vedic sacrifices, puja and devotional worship could lead a person in the direction of jnana, true knowledge, they could not lead him directly to Moksha. The term Pramā in Sanskrit refers to the “correct knowledge,” arrived at by thorough reasoning, of any object. The process of cognition, or arriving at correct knowledge involves three elements (tripuṭi, trio): Pramātṛ the subject, or the knower of the knowledge; Pramāṇa (sources of knowledge, Sanskrit), the cause or the means of the knowledge; and Prameya, the object of knowledge. The pragmatic or the Vyāvahārika level, in which both Jiva (living creatures or individual souls) and Ishvara (the external manifestation of Brahman) are perceived to be true; the material world is completely true. The apparent or the Prāthibhāsika level, in which the material world is perceived as true, but the perception is actually false and illusory, like a dream or the perception of a rope as a snake. Nimitta kāraṇatva—Being the instrumental cause. A potter is assigned Nimitta kāraṇatva because he acts as the maker of the pot and thus becomes the pot's instrumental cause. Upādāna kāraṇatva—Being the material cause. The clay in the pot is assigned Upādāna kāraṇatva because it acts as the material from which the effect (the pot) is realized and thus becomes the pot's material cause. From statements found in the Vedas, Advaita assigns both Nimitta kāraṇatva and Upādāna kāraṇatva to Brahman, concluding that Brahman is both the instrumental cause and the material cause of the universe. During the time of its existence, the effect does not appear different from the cause, and the difference between cause and effect is not readily understood. For example, the reflection of a gold ornament seen in the mirror has the same appearance as the ornament, but is not the ornament itself, since the reflection has no gold in it at all. In the context of Advaita Vedanta, Jagat (the world) is not different from Brahman; however Brahman is different from Jagat. 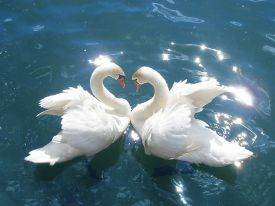 The swan is an important motif in Advaita. It symbolizes two things: first, the swan is called hamsah in Sanskrit (which becomes hamso if the first letter in the next word is /h/). Upon repeating this hamso indefinitely, it becomes so-aham, meaning, "I am That." Second, just as a swan lives in water but its feathers are not soiled by water, similarly a liberated Advaitin lives in this world full of maya but is untouched by its illusion. Nityānitya vastu viveka—The ability (viveka) to correctly discriminate between the eternal (nitya) substance (Brahman) and the substance that is transitory existence (anitya). Ihāmutrārtha phala bhoga virāga—The renunciation (virāga) of enjoyments of objects (artha phala bhoga) in this world (iha) and the other worlds (amutra) like heaven etc. Śamādi ṣatka sampatti—the six-fold qualities of śama (control of the antahkaraṇadama (the control of external sense organs), uparati (the refraining from actions; instead concentrating on meditation), titikṣa (the tolerating of tāpatraya), śraddha (the faith in Guru and Vedas), samādhāna (the concentrating of the mind on God and Guru). Mumukṣutva—The firm conviction that the nature of the world is misery and the intense longing for moksha (release from the cycle of births and deaths). Adi Shankara's opponents accused him of teaching Buddhism in the garb of Hinduism. Both Shankara and his predecessor Gaudapada were accused of being crypto-Buddhists, while on the other side, Theravadins criticized Mahayana Buddhism for being a degeneration back into Hinduism." However, while the Later Buddhists arrived at a changeless, deathless, absolute truth after their insightful understanding of the unreality of samsara, historically Vedantins never liked this idea. Although Advaita also proposes the theory of Maya, explaining the universe as a "trick of a magician," Adi Shankara and his followers see this as a consequence of their basic premise that Brahman is real. Their idea of Maya emerges from their belief in the reality of Brahman, rather than the other way around. Adi Shankara was a peripatetic orthodox Hindu monk who traveled the length and breadth of India. The more enthusiastic followers of the Advaita tradition claim that he was chiefly responsible for "driving the Buddhists away." Historically the decline of Buddhism in India is known to have taken place long after Adi Shankara or even Kumarila Bhatta (who according to a legend had "driven the Buddhists away" by defeating them in debates), sometime before the Muslim invasion into Afghanistan (earlier Gandhara). Although today's followers of Advaita believe Adi Shankara argued against Buddhists in person, a historical source, the Madhaviya Shankara Vijayam, indicates that Adi Shankara sought debates with Mimamsa, Samkhya, Nyaya, Vaisheshika and Yoga scholars as keenly as with any Buddhists. In fact his arguments against the Buddhists are quite mild in the Upanishad Bhashyas, while they border on the acrimonious in the Brahma Sutra Bhashya. The Vishistadvaita and Dvaita schools believe in an ultimately saguna (dualistic) Brahman. They differ passionately with Advaita, and believe that his nirguna (monistic) Brahman is essentially not different from the Buddhist Sunyata (wholeness or zeroness), much to the dismay of the Advaita school. A careful study of the Buddhist Sunyata will show that it is in some ways metaphysically similar as Brahman. Whether Adi Shankara agrees with the Buddhists is not very clear from his commentaries on the Upanishads. His arguments against Buddhism in the Brahma Sutra Bhashyas are more a representation of Vedantic traditional debate with Buddhists than a true representation of his own individual belief. There is also a great variety of modern scholarly research devoted to comparing the non-dualistic Buddhism with the classical Advaita Vedānta. The primary difference lies in the fact that unlike Mahayana Buddhism, Advaita Vedānta is rooted, by definition, in the source texts of the Vedānta. For the Advaita Vedāntin, the ultimately non-dual nature of reality is not a matter of logical inference or philosophical analysis; rather, it is a scriptural given, to be known, understood and experienced. Furthermore, this ultimate, eternal, non-dual reality is equated with one's innermost Self, whereas Buddhism fundamentally questions the eternality of the Self. Advaita Vedānta, like other Vedanta schools of Hindu philosophy, recognizes the following three texts (known collectively as the Prasthānatrayī) of the Hindu tradition: Vedas- especially the Upanishads, Bhagavad Gita and Brahma Sutras. These texts are considered to be the basic texts of the advaita tradition; many authors, including Adi Shankara, have written Bhashyas (commentaries) on these texts. Other texts include, Advaita Siddhi, written by Madhusudana Saraswati, Shankara Digvijaya—Historical record of Adi Shankara's life accepted by scholars worldwide. Among other ancient advaitic texts, two of the most prominent are Avadhuta Gita and Ashtavakra Gita. The consensus among modern scholars is that only Upadeśasāhasri can be securely attributed to Shri Shankara himself. Vishishtadvaita, an opposing philosophy that propounds "qualified nonduality"
Dvaitadvaita, an opposing philosophy that presents "duality and nonduality"
↑ Celextel online spiritual library. Aitareya Upanishad.Aitareya Upanishad, Celextel's Online Spiritual Library. Retrieved December 11, 2007. ↑ Chandogya Upanishad. Retrieved December 11, 2007. ↑ Swami Gambhirananda (trans.) Published by Advaita Ashram, Kolkatta Taittiriya Upanishad. Retrieved December 11, 2007. ↑ Brahma Sutras, Swami Sivananda. Retrieved December 11, 2007. ↑ Antahkarana- Yoga (definition), mimi.hu. Retrieved December 11, 2007. ↑ David Loy. Enlightenment in Buddhism and Advaita Vedanta: Are Nirvana and Moksha the Same?, National Univ. of Singapore. Retrieved December 11, 2007. ↑ Daniel H. H. Ingalls. Shankara's arguments against Buddhism, Philosophy East and West 3 (4) (January 1954): 291-306 (University of Hawaii Press). Retrieved December 11, 2007. ↑ Anand Hudli The First Definition of Unreality, Advaitasiddhi.org. Retrieved December 11, 2007. Deutsch, Eliot. Advaita Vedanta: a philosophical reconstruction. Honolulu: East-West Center Press, 1969. Deutsch, Eliot and J. A. B. van Buitenen. A source book of Advaita Vedanta. Honolulu: University Press of Hawaii, 1971. Karmarkar, Raghunath D. Sankara's Advaita. Dharwar: Karnatak University, 1966. Mishra, Adya Prasad. The development and place of bhakti in Sankaran Vedanta. Allahabad: University of Allahabad, 1967. Mishra, M. Bhāratīya Darshan. (भारतीय दर्शन) Kalā Prakāshan. Mudgal, S.G.. Advaita of Sankara, a reappraisal: Impact of Buddhism and Samkhya on Sankara's thought. Delhi: Motilal Banarsidass. Pandey, Rewati Raman. Scientific temper and Advaita Vedanta. Varanasi: Sureshonmesh Prakashan, 1991. Panoli, V. Upanishads in Sankara's own words: Isa, Kena, Katha, and Mandukya with the Karika of Gaudapada: with English translation, explanatory notes and footnotes. Calicut, INDIA: Mathrubhumi, 1991-1994. Potter, Karl H. (ed.) Advaita Vedanta up to Sankara and his Pupils: Encyclopedia of Indian Philosophies, vol. 3. Princeton, NJ: Princeton University Press, 1981. Ramamurti, A. Advaitic mysticism of Sankara. Visvabharati, Santiniketan, 1974. Rewati Raman Pandey. Scientific temper and Advaita Vedanta. Varanasi: Sureshonmesh Prakashan, 1991. Sinha, H. P. Bharatiya Darshan ki ruparekha. (Features of Indian Philosophy) Motilal Benarasidas, Delhi–Varanasi. 1993. Swāmi Paramānanda Bhārati. Vedānta Prabodha. (in Kannada) Jnānasamvardhini Granthakusuma, 2004. Venkatarama Aiyar, M.K. Advaita Vedanta, according to Sankara. Asia Publishing House, New York, 1965. Verma, Satyapal. Role of Reason in Sankara Vedanta. Delhi: Parimal Publication, 1992. Madhava Vidyaranya. Sankara-Digvijaya. translated by Swami Tapasyananda, Sri Ramakrishna Math, 2002, ISBN 8171204341 Ramakrishna Math, Chennai. Retrieved December 11, 2007. This page was last modified on 3 February 2019, at 16:38.